The Tardis will have a raft of new personnel when Jodie Whittaker, the first female Doctor Who, takes the controls for the first time next year. The BBC has unveiled three new assistants who will assist the 13th Doctor: the quiz show host Bradley Walsh, plus Mandip Gill and Tosin Cole. They will play the Doctor's companions, Graham, Yasmin and Ryan, in the 10-week series set for broadcast in autumn 2018. Walsh, who will be 58 when he makes his debut, will be the oldest actor ever to play a regular companion. The average age of debuting companions is 28. The second oldest actor in such a role was Matt Lucas, who was 43 when he joined in April 2017. He and Walsh are the only actors who have been over 40 when joining the show's permanent cast as assistants. Two actors were 39, however, when they made their first proper appearance as a companion: Catherine Tate in 2008 (as Donna) and William Russell in 1963 (as Ian, one of the original assistants). The long-running BBC sci-fi show is undergoing a complete revamp of its leading cast members. Whittaker, star of Broadchurch and Trust Me, will take over in the Tardis from Peter Capaldi after the Christmas special, when the character will metamorphose into a woman for the first time. Capaldi has played the Doctor since 2013. Walsh, an actor and comedian as well as a quiz show host, is widely expected to become the Doctor's new right-hand man, although details of his exact role are yet to be confirmed. The Doctor's new sidekicks will join an illustrious line of male and female actors, including Pearl Mackie, who is currently starring alongside Capaldi. Others of recent vintage include Jenna Coleman and Noel Clarke. remember watching William Hartnell as the first Doctor [1963-66]. Black and white made it very scary for a youngster like myself. "I was petrified, but even though I'd watch most of it from behind the sofa through my fingers, I became a fan. Am I thrilled to be part of this whole groundbreaking new dawn for the Doctor? Oh yes." Gill, 29, from Leeds, who has appeared in Hollyoaks and Casualty, said she was "over the moon" to be appearing in the long-running programme as Yasmin. "This is an iconic show with an amazing fanbase and I look forward to everything that brings," she said. "Certain roles seem unattainable and this is one of those, so much so I didn't believe it to be true for the first few weeks." Chris Chibnall, the show's new head writer, who most recently wrote the final series of Broadchurch, described the new ensemble as three of Britain's brightest talents. APA 6th ed. : Busby, Mattha (2017-10-25). 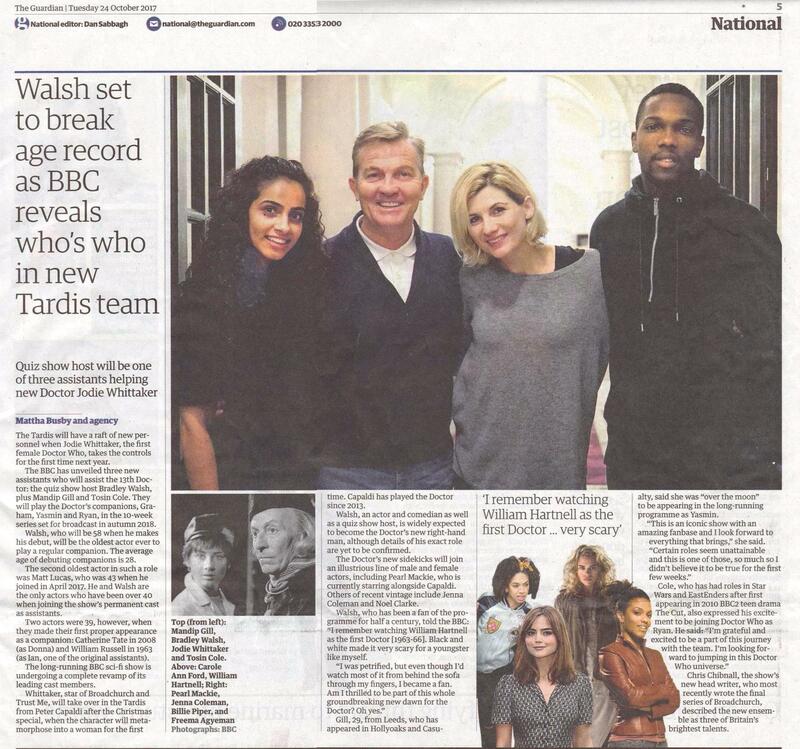 Walsh set to break age record as BBC reveals who's who in new Tardis team. The Guardian p. 4. MLA 7th ed. : Busby, Mattha. "Walsh set to break age record as BBC reveals who's who in new Tardis team." The Guardian [add city] 2017-10-25, 4. Print. Turabian: Busby, Mattha. "Walsh set to break age record as BBC reveals who's who in new Tardis team." The Guardian, 2017-10-25, section, 4 edition. This page was last modified on 21 March 2019, at 01:50.